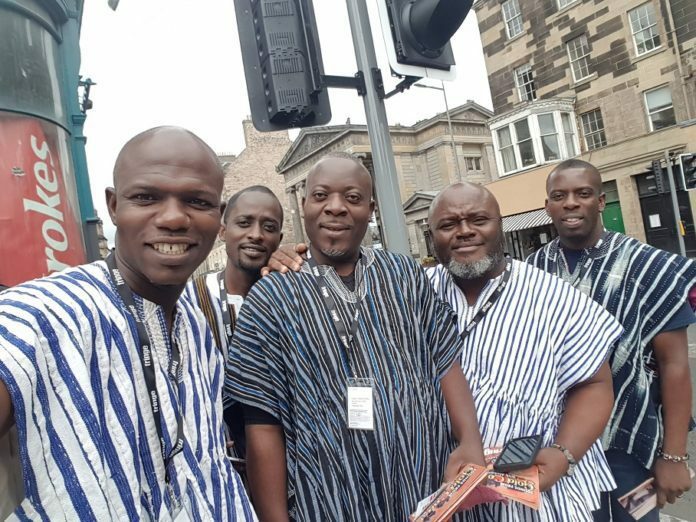 Ghana’s leading Acappella quartet, Alabaster Box is set to be the toast of this year’s Edinburgh Fringe Festival in Scotland, with their act dubbed “Sounds from Gold Coast”. The hour-long package, which a is mix bag of the group’s Afroppella songs and anecdotes about Ghanaian cultures, is slated for two-weeks at the Fringe and another two weeks in various churches in London. The group kicked off the act on Saturday, August 4, 2018, with a thrilling performance, complemented by their Fugu costume from northern Ghana. Prior to the opening act at the historic Saint John’s Church stage, the group had a meet the press session with various leading Scottish media houses such as The Scotman, The List, Fringe Review, Three Weeks, Broadway Baby and others. Leader of the group, Samuel Dowuona said the Fringe Festival always presents a great opportunity for the group to showcase Ghana in a unique way. “In 2015 when we first went to the Fringe our act was dubbed ‘Afroppella’ and it was designed to introduce our typically Ghanaian style of acappella to the patrons – this time round we want to tell them more about our country through our music and anecdotes,” he said. Sammy noted that the millions of patrons at the Fringe, coupled with the millions more that get to watch the various acts online, presents a great opportunity for Ghana’s culture and tourism attractions to be showcased. “We are doing our bit and we believe initiatives like ours should be supported by corporate to make it easier for groups like ours to attend such festivals and showcase the country’s cultural heritage and unique potentials,” he said. According to him, while at the Fringe, the group would also engage extensively in their typical evangelistic ministry in collaboration with Carrubbers Christian Centre to win souls for Christ. He says, once the Fringe is over, the group will move to London, where it will minister in various churches and institutions before returning to Ghana early next month.